Need a surprising gift to bring sunshine to their door? This fancy arrangement is a perfect combination of 20 golden roses and leucadendron which are beautifully decorated with ruscus and tree fern asparagus. A delightful way to show your true love and make their day special! Next day delivery available for orders placed before 4pm. Handy Flowers went above and beyond with my wedding bouquet, they used my favourite flowers and made it look absolutely out of this world! Everything about the flowers was fantastic. The look, freshness and arrangement all exceeded my expectations. Your florists know what they are doing! A friend of mine was having a birthday party in Cornwall that I couldn't attend. I selected this arrangement from the flower shop, ordered it and waited to hear from the birthday girl. At around 11am she rang to say the flowers were fantastic. Thanks a million times! Gorgeous roses. The gift that every woman deserves to receive! Fantastic box of flowers! The delivery was made on time for my sister's birthday. 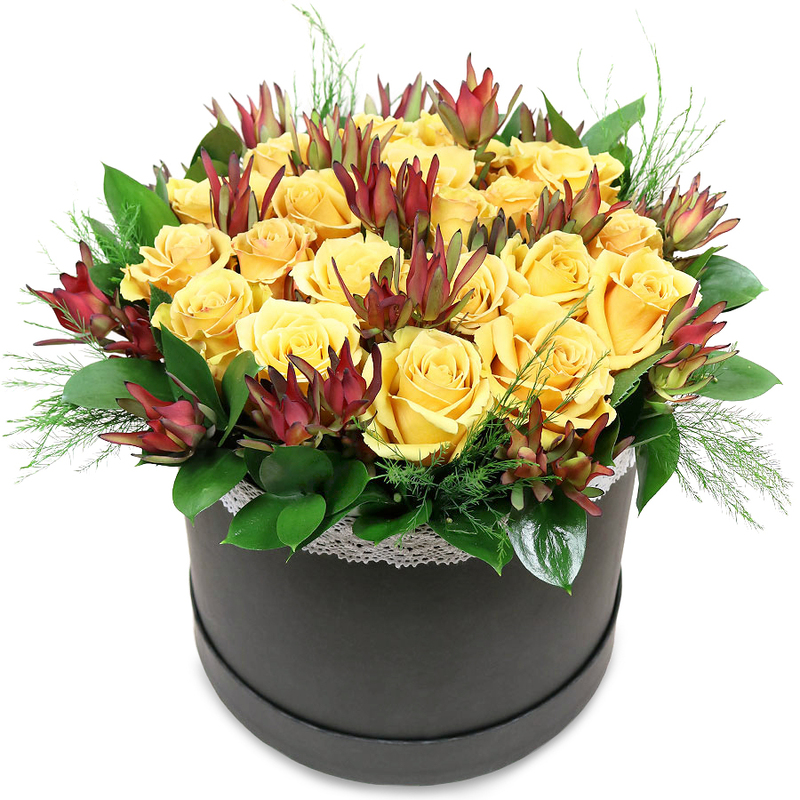 Yellow roses are always bringing a bright and positive feeling. Got this arrangement as a gift from a dear friend and I couldn't believe how beautiful it was. The flowers were well-arranged and remained fresh for more than a week. I was looking for some beautiful flowers to send to my girlfriend and when i saw this arrangement i knew it would make an amazing surprise gift! Thank you Handy Flowers for the wide variety of wonderful flowers to choose from!